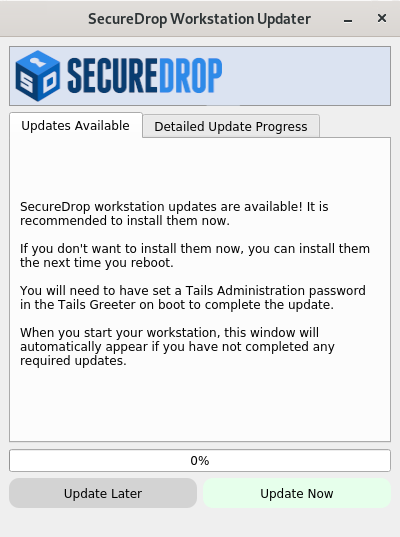 We recommend that you update all Tails drives to version 3.10, which was released concurrently with SecureDrop 0.10.0 on October 23, 2018. Follow the Tails graphical prompts on your workstations to perform this upgrade. If you do see the warning “refname ‘0.10.0’ is ambiguous” in the output, we recommend that you contact us immediately at securedrop@freedom.press (GPG encrypted). If you have previously downgraded your kernel, as part of the the upgrade process to SecureDrop 0.10.0, the default Linux kernel will change to the latest released kernel (version 4.4.144). The 3.14.x series kernel will be removed with release 0.11.0 (scheduled for December 11). Please report kernel compatibility issues immediately to avoid extended downtime.